When you tune in with the Adi Mantra, you connect with your higher self. This is an ancient Sanskrit mantra and translates the intent, "I bow to my divine consciousness" , "I call upon the creator", "I call upon Divine Wisdom", and "I recognize this higher consciousness in others." POSTURE: Sit in a comfortable meditative posture. Chin in and chest out. maintain the hand position throughout the exercise. relax and may roll up. the left nostril is more active than the right. original position. Repeat on opposite side. will feel that the right nostril is more active. paced breath, not quick and not slow. TIME: 11 minutes. Can be increased with practice and experience. TO END: Inhale and stretch the arms up, looking through the 10th gate meaning your spiritual aperture of consciousness, your personal portal through which you attain spiritual realization, the "Guru's Gateway." Exhale and relax. When completing a Kundalini Yoga Yoga and/or Meditation set, it is tradition to sing "Long Time Sun" song. Please see www.MeditationInMind.com webpage for Healing Sounds and Songs. You may then chose to finish your meditation session with some personal prayers. What is a Mantra? What is a Mudra? Hindu, Buddhist origin, a sound or word to facilitate concentration in meditation. A frequently repeated word, phrase, or statement of intention; a symbolic refrain. 1. Indic Hindu religion a "mudra" (Sanskrit, literally "seal") is a symbolic gesture made with the hand or fingers. Along with asanas (postures), they are utilized in yoga meditation practice. Each mudra has a specific meaning, and are a central part of Hindu and Buddhist iconography. 3. An example would be the outward-facing open palm known as Abhay (without fear) mudra, a gesture meant to dispel the fear of the devotee. 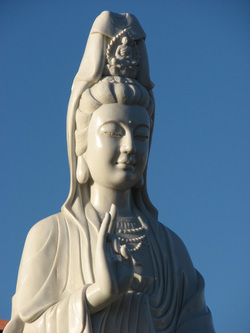 Pictured (Left) is the Goddess of Compassion, Gyan Yin.